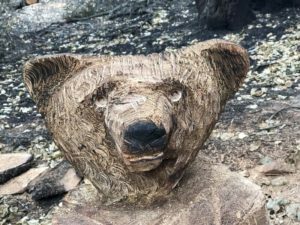 Have you ever wondered what happens after a wildfire rages through a forest? You probably never thought about it unless the forest was under your stewardship as part of your property. 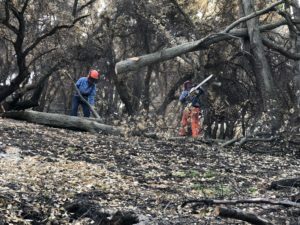 The Thomas Fire, California’s biggest wildfire in history, raged through our forest in early December 2017. We were among the lucky ones – our home and buildings were untouched. Our forest was another story – we estimate 40% of our coastal oaks and black walnut trees were destroyed. Some of the trees remained standing even though a large portion of their trunks were eaten by the flames. Some went down and the only thing left is a big hole where the roots once anchored the tree to the earth. Some became works of art. 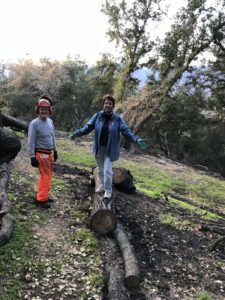 Because we are always looking for ways to move more and move more of our bodies, in our forest we have trees to hang from, fallen trees to balance on, and we created a system of trails for hiking. Little did we know these trails would act as firebreaks when the raging inferno came through. 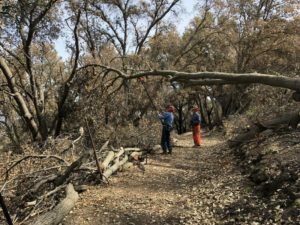 When we were finally able to walk those trails that were not blocked or damaged by fallen trees, we were overwhelmed with the devastation of what had once been our forest. And, we were at a loss to know where to begin to “clean up” and move on to make the forest safe again. The solution came in the form of an offer from my sister, Linda, and her husband, Ken, to drive down from their home in Oregon and help us formulate a plan. We gratefully accepted and they arrived the first part of March with three chain saws, an axe, wedges, drills, a peavey and all sorts of “stuff” to go to work in the forest. Ken grew up in Oregon on a 160-acre forested piece of land. From the time he was 10, his father began teaching him the skills and dangers of logging. To this day, he continues to utilize his extensive logging expertise to help neighbors and friends and us. He celebrated his 74th birthday in late March. In 2004, while working on the exterior of a home, Ken fell from a 20-foot ladder landing on a concrete patio. He suffered severe fractures in his pelvis and shoulder region. He was hospitalized for weeks and recovery was slow and painful. Because he could not tolerate pain medication, he dealt with his continuous discomfort by engaging his mind in physical and intellectual activities and his body in physical movement. 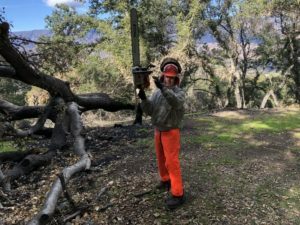 In this blog, are some of his extreme moves while working on the Ranch using a 25 pound chainsaw with a 28″ bar. For one week in early March 2018, Ken (73) and Linda (72) spent every day with my hubby Willis (81) and me (Joan 79) out in the forest, strategizing on what needed to be done and how to do it. And then, with help from all of us, Ken led the way with his chainsaw and axe. By the end of the week, the danger from burned trees standing and fallen had been minimized and our forest was once again accessible. Ken and Linda have been married for 48 years and are an inseparable team. She accompanies him on his chainsaw expeditions as his early warning system in case of unforeseen dangers. And she cheers him on as his creative side takes over for some chainsaw carving. In our forest he left us with an owl carved out of a stump, a four-legged stool carved out of a piece of a tree, a contemplation bench looking over our forest up to the surrounding mountains, a wooden armchair carved out of a 3-pronged branch, a teeter-totter from a fallen branch, and finally on the last day, he felled a tree and with his chainsaw set free the head of the bear hidden inside the trunk. 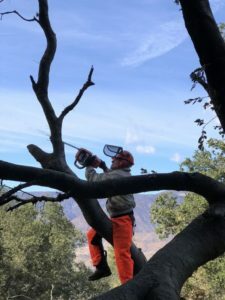 MOVEMENT TIP: In my experience, when I am really focused, I may stand for extended periods of time (such as watching chain sawing and pole sawing over a week’s period of time), and then wonder why I end up with a backache and sore/tired feet. 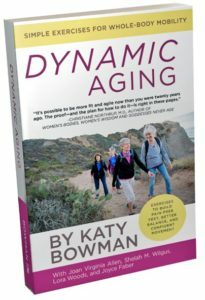 Working with Katy Bowman’s restorative exercises and nutritious movement, I have learned this is the result of standing with my pelvis thrust out in front of my body thus compressing the vertebra in my lumbar spine and placing an inordinate amount of weight on the balls of my feet. This week spent cleaning up our forest allowed me the opportunity to mindfully practice getting my weight back in my heels helping to align my body and utilize the muscles necessary for adequate support. Here’s a link to Katy Bowman’s blog that shows how this works: https://nutritiousmovement.com/mind-your-pelvis/. You don’t have to be observing chain sawing or pole sawing to practice this. How about while you are standing in line or holding a child in your arms or working at the sink? Try it. You’ll like it. Sounds like you had the best experts anyone could ask for and you and Willis were a part of the forest clearing and decorations. Please bring lots of pictures with you when you visit. I am so looking forward to seeing you both and sharing a little time together with stories and life in general. I am sure every day gives a new way and view on which to practice your balance, walking and working with your bodies. Again, very inspiring. Joan, thank you for sharing this update on your beautiful property & the family clearing, cleanup project. So glad you & Willis are ok & making lemonade out of lemons. Love the bear head. Nice Team Movement work! and a bear to boot! We loved being part of the clean up. It was great exercise while accomplishing a seemingly overwhelming task. Clearing the forest. A wonderful metaphor for restoration. I have a clear picture of how you and Willis were impacted by the raging wildfires. 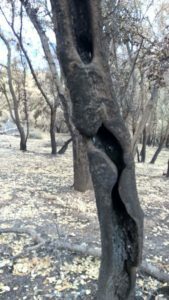 I loved your beautifully written blog on forest fires. Thanks for the inclusion on foot health. A friend is having an acute bout of foot, hip and low back pain & appreciates the dots you gave in your blog- she can easily connect them, & choose to begin her recovery & healing work.